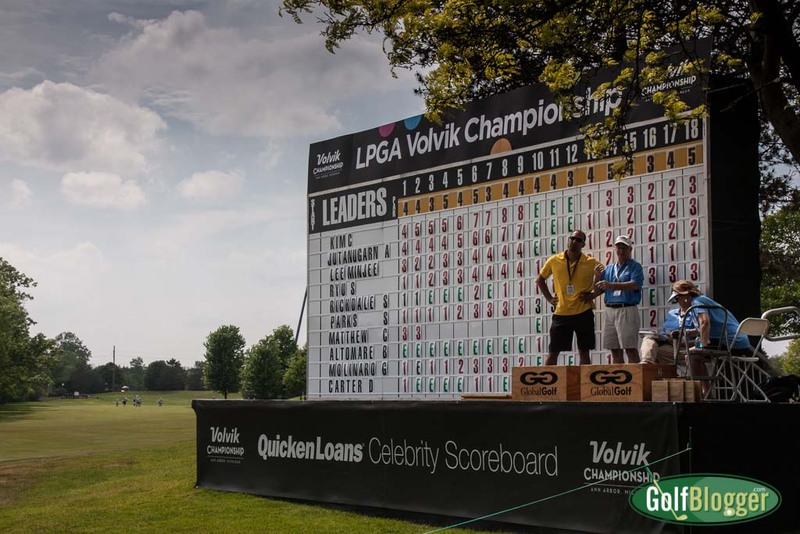 At the end of the first day, Christina Kim lead the Volvik Championship at eight under. Christina Kim leads the inaugural Volvik Championship following a stellar round of 64 (-8) at Travis Pointe Country Club in Ann Arbor. Ariya Jutanugarn, who is going for her third win in a row, is just one shot back after a bogey free round. Kim’s 64 was nearly ten shots better than the field average on Thursday. Kim’s round was over well before I arrived (after work) and the afternoon rounds were not nearly as low as the morning’s. 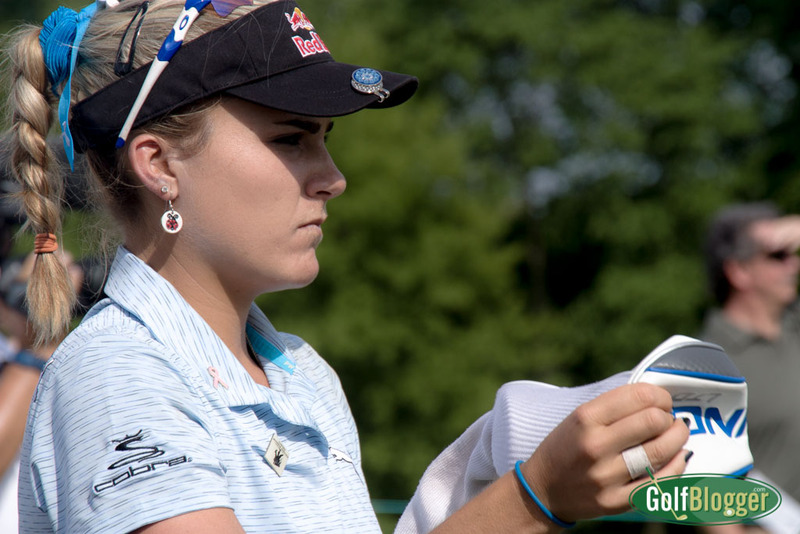 After wandering around the course for a while, I decided to follow the group of Lexi Thompson, Charley Hull and Shanshan Feng. Thompson has the kind of length that I thought might feast on this course, but she struggled to a two over. Jutanugarn, who is just one off the lead is one of the tour’s longer hitters, averaging 268 off the tee. I did see Thompson make an eagle on the fourteenth. Following a drive that drifted shortly off line to the right and under a small tree, Thompson hit a four iron out of the rough onto the green. That was followed by a one-putt. On the eighteenth, Thompson uncorked a 314 yard drive, and just missed the green with her second shot. 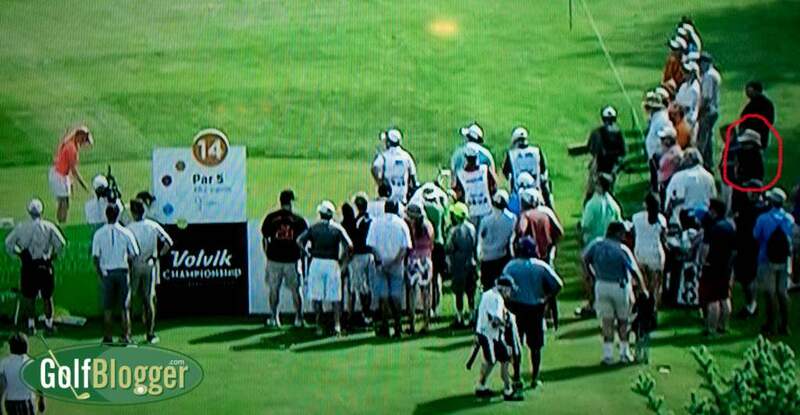 The group I was following was one of the ones covered by The Golf Channel, and when I watching the delayed coverage, I noticed that I had been caught in the coverage. While wandering the course, I ran into a nice couple that I often play with at my home course of Green Oaks in Ypsilanti. Later, I ran into two acquaintances who were working as volunteers. Those chance encounters reminded me that an event like an LPGA Tournament can really bring a community together. In addition to being a place where you are likely to run into your golf-loving friends, the tournament has reached out to a lot of recognizable area institutions. Motawi Tileworks — the creator of the Volvik Championship trophy — had a tent there, as did Zingerman’s and the M-Den. DTE Energy is sponsoring a Military Appreciation Skybox. Volvik Thursday-6609 The Volvik merchandise tent had a display of balls with the likenesses of their players. Volvik Thursday-6611 The putting green on Thursday, May 26. Note the international flags. The LPGA is truly an international tour. Volvik Thursday-6612 Ann Arbor’s Motawi Tileworks produced the tournament’s unique tile trophy. Volvik Thursday-6613 The Volvik Championship benefits the National Network of Depression Centers. Volvik Thursday-6614 A mini golf game near the driving range. Volvik Thursday-6615 At the end of the first day, Christina Kim lead the Volvik Championship at eight under. Volvik Thursday-6624 Viky Hurst lines up a putt on the 17th green. Volvik Thursday-6625 Giant inflatable golf balls drifted around in the pond to the right of the 18th green. Volvik Thursday-6626 No game of golf would be complete without at least one quote from Caddyshack. Volvik Thursday-6629 Mariajo Uribe on the sixteenth green. Volvik Thursday-6632 Looking back at the thirteenth fairway. Volvik Thursday-6640 Charley Hull on the fourteenth green. Volvik Thursday-6644 Charley Hull on the fifteenth. Volvik Thursday-6645 Sarah Hoffman (left), a local player who was one of Volvik’s two sponsors’ exemptions, and Cheyenne Woods. Volvik Thursday-6650 Cheyenne Woods swings. Volvik Thursday-6652 A view of the sixteenth green. Volvik Thursday-6654 A camera crane along the eighteenth fairway. Volvik Thursday-6655 Looking at the eighteenth green.